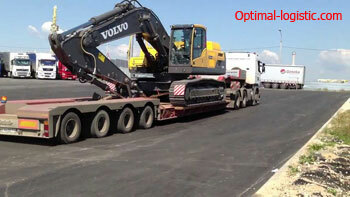 One of the services provided by our transport company Optimal Logistic is the transportation of excavators. We carry out transportation on the territory of Ukraine, Europe and Central Asia in any directions. You can get the service for transportation of the excavator here on the site http://optimal-logistic.com by calling the indicated telephones, sending an e-mail or ordering a return call. You can fill out the preliminary cost calculation form yourself. In an on-line mode, our managers will contact you and specify all details of the order, calculate the cost of services. use of branded fasteners and chains ensure the safety of the goods. Transportation of an excavator with our company is transportation in the shortest time, absence of unforeseen situations, professionalism of employees, ensuring reliability and prompt delivery, reasonable cost of services. Customer care is the basic principle of our work.